This coming June 22, 2016 at Makati Sports Club, Makati City from 9AM to 2PM, Zoomanity Group invited 300 Travel & Tour Operators, Travel Agencies and media for the company’s annual appreciation day event to give thanks to their partners for the overwhelming support throughout the year. The program includes dance presentations from Halili- Cruz School of Ballet and Digital Marketing talk by Engr. 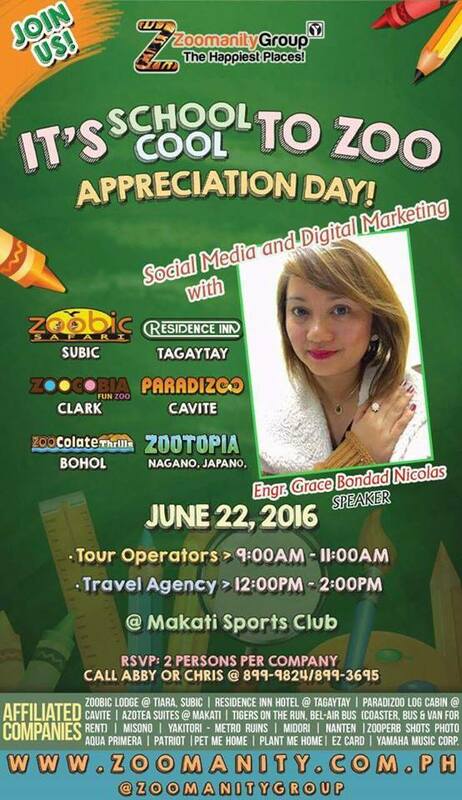 Grace Bondad Nicolas of TAG Media and Public Relations plus a lot of surprises for our partners. Zoomanity Group is one of the leading companies in park industry in the Philippines. It consists of 5 local theme parks and 2 international facilities; Zoobic Safari in Subic, Zoocobia Fun Zoo and Clarkzilla in Clark, Residence Inn in Tagaytay, Paradizoo in Mendez, Cavite, Zoocolate Thrills in Loboc, Bohol, Zootopia in Nagano Japan and Breeding and Research Farm Facility in Victoria, Australia. Please contact TAG Media & Public Relations at 09166299381 or send inquiries to grace@asiadigitalmarketing.ph or check http://www.zoomanity.com.ph TAG Media & Public Relations is the marketing and branding arm of Zoomanity Group which is under the Yupangco Group of Companies headed by Robert Laurel Yupangco.